This would be my second time visiting this lounge but my first time writing about it. 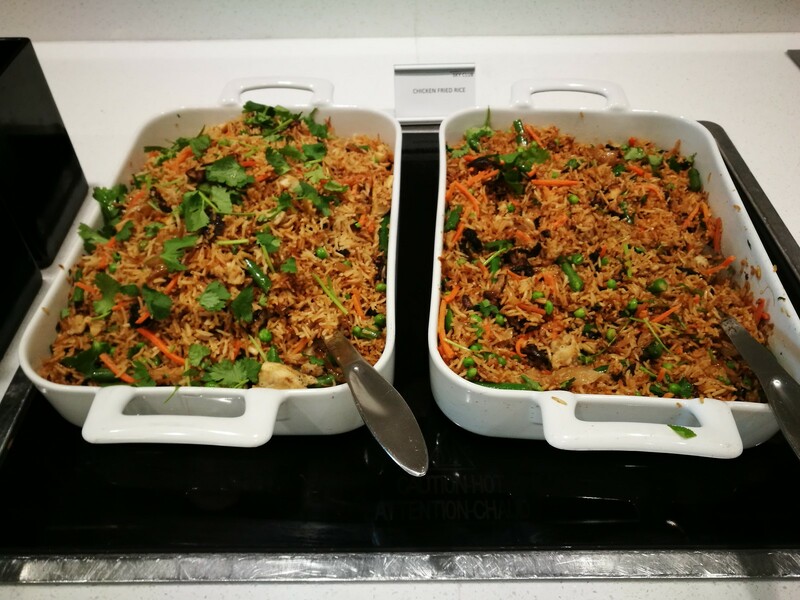 Thus I would add in photos for 2 types of meal service served inside the lounge. I had an early morning start as I was to take a short shuttle flight to Los Angeles before connecting on Delta’s 777 back across the Pacific. 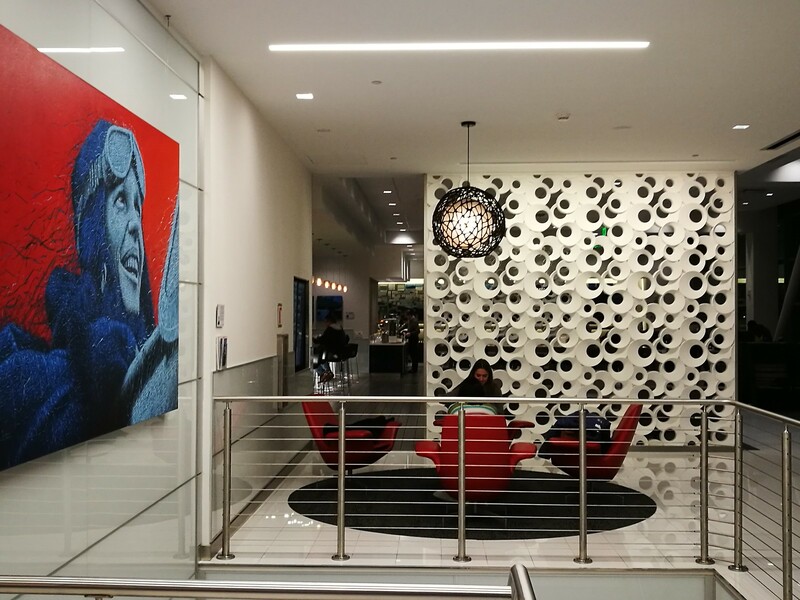 I was dropped off by the hotel shuttle from aloft San Francisco Airport Hotel where I stayed the previous night. From there, I head to the Sky Priority counter which had another person being attended to on the right. Another staff member came over to assist me with check in and tag my bags all the way to Shanghai which will be my eventual destination. Once I obtained the boarding passes, the security line was quick too and in the priority lane, there was only some airport staff getting ready for their shift in front of me. Even the normal line queue was short, and it could be due to the fact the sun has not even risen yet at this time of the day. 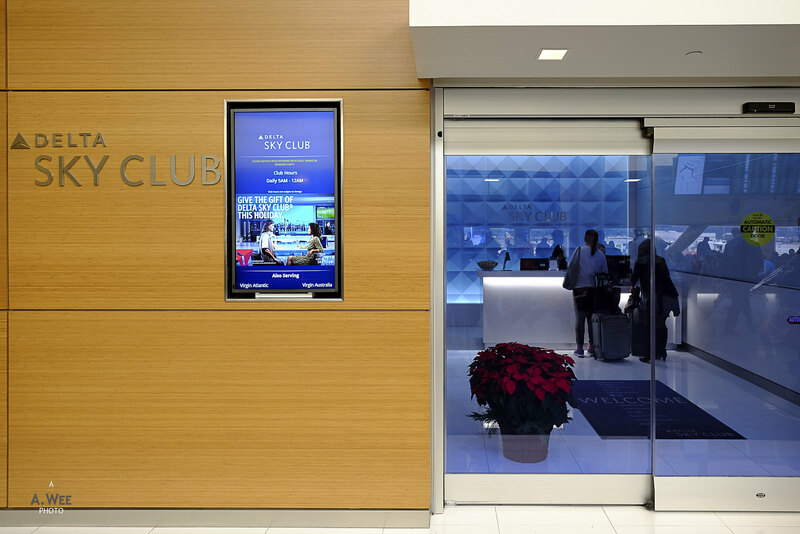 It is not difficult to find the entrance to the lounge with the distinctive branding and cool blue sliding glass doors. 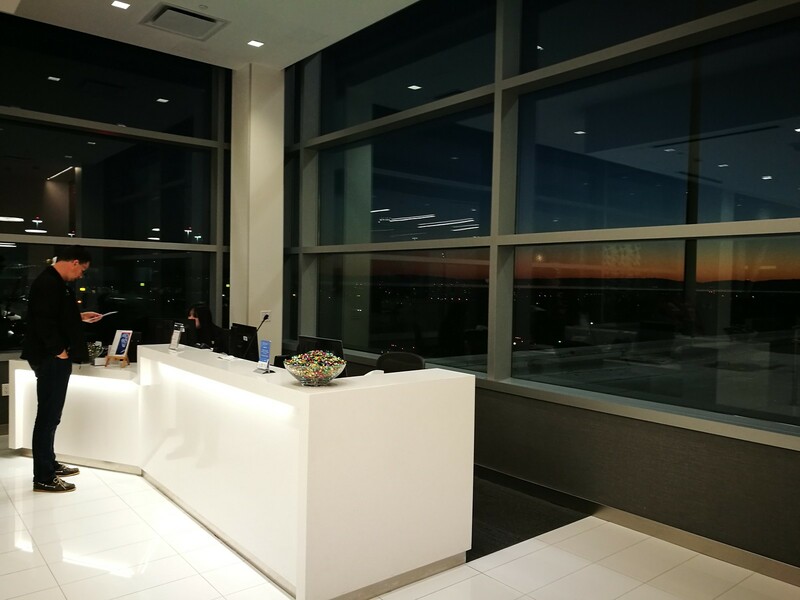 Having passed the receptionist my boarding passes, I was directed to the elevators to the second floor. On top, there was yet another reception area with a small alcove with seats for 2 and a table where a chess set lie. While the alcove was nice for a photo op, I doubt many lounge guests use this space at all. 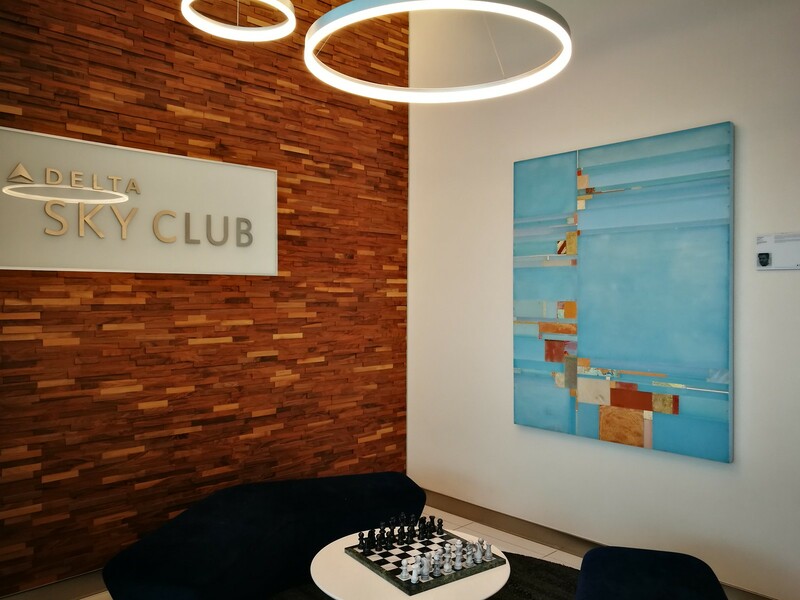 One thing I liked about Sky Clubs are their art work installations and this one is no different with a vintage pilot painting gracing the staircase atrium. There is also the wall mural depicting San Francisco’s landmark Golden Gate bridge at the end. I enquired for the possibility to use the shower here with the receptionist based on the second floor desk. With that she escorted me to the shower rooms at the end of the lounge. However this time I had to verbally ask her for the bath amenities, unlike the first time when I was automatically asked if I wanted any amenities. This is because there are no bath amenities inside the shower area itself so guests might perhaps want to bring their own because there was some items that were not available when I visited. 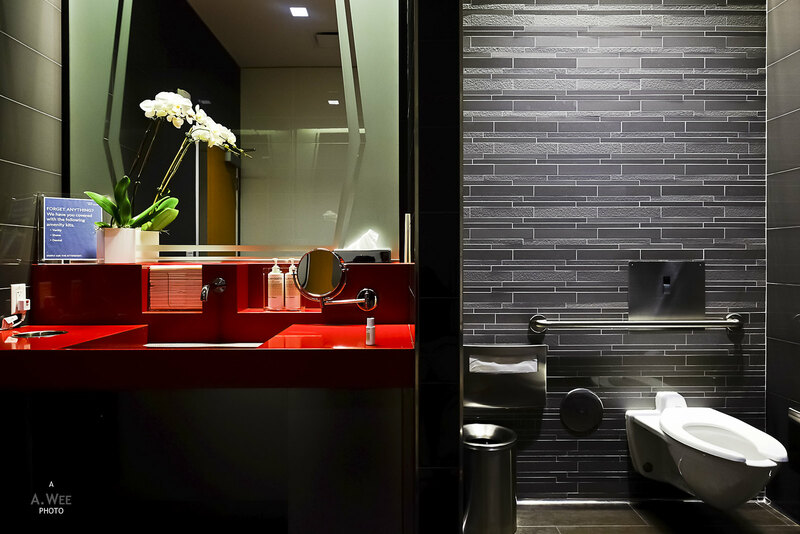 The bathroom has a cool contemporary theme and was a nice space to relax and have a shower in. I would rate it highly amongst airport lounge bathrooms since there was a long wooden bench to place your hand carry, and the space was bright and clean, even with the dark tiles around. On the other side, there is a generous vanity countertop area and a toilet, with the walk-in shower area at the end. By the shower area there was another wooden stool with freshly packed towels and floor mats. 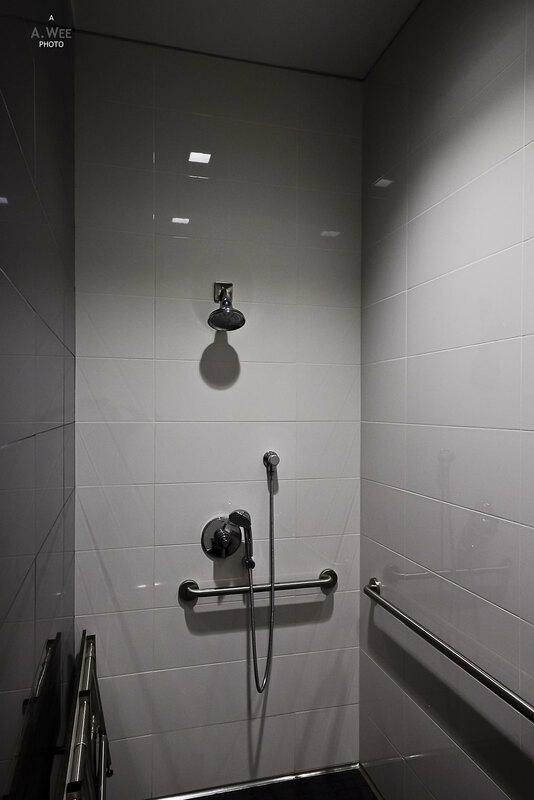 The shower accessories consisted of a rain shower head and a hand-held one. There was no problems at all with hot water or the pressure so the basics are done right! The best part of the shower was guests gets a small toiletry bag branded by Tumi and a complete set of Malin + Goetz amenities, with a shampoo, conditioner, body wash, body lotion, and a deodorant stick by another brand. There was also a comb and a dental kit. A shaving kit was also available. However on my second visit, all I got was the shampoo, conditioner and body lotion, thus the consistency of the items guests might get is totally different. 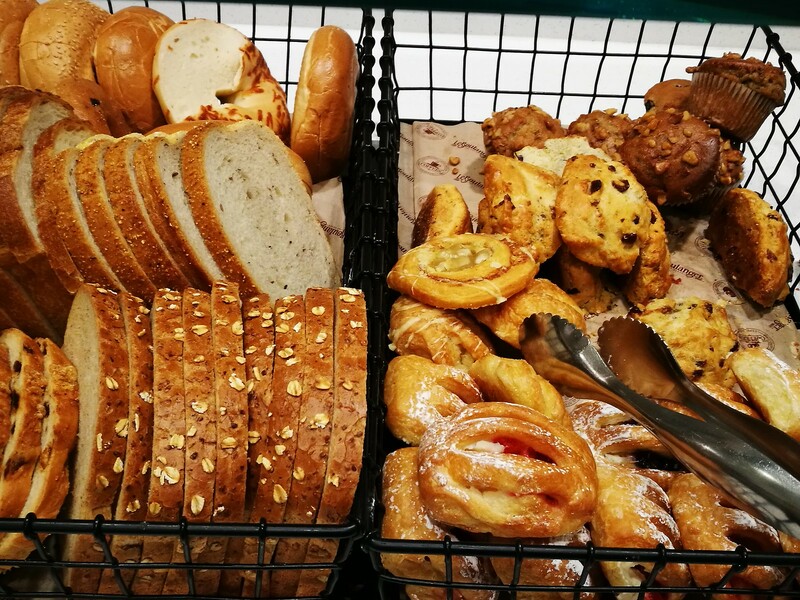 Having refreshed myself for the long day ahead, I proceeded to the buffet counter for some breakfast since all I had so far was a cup of coffee from the hotel. 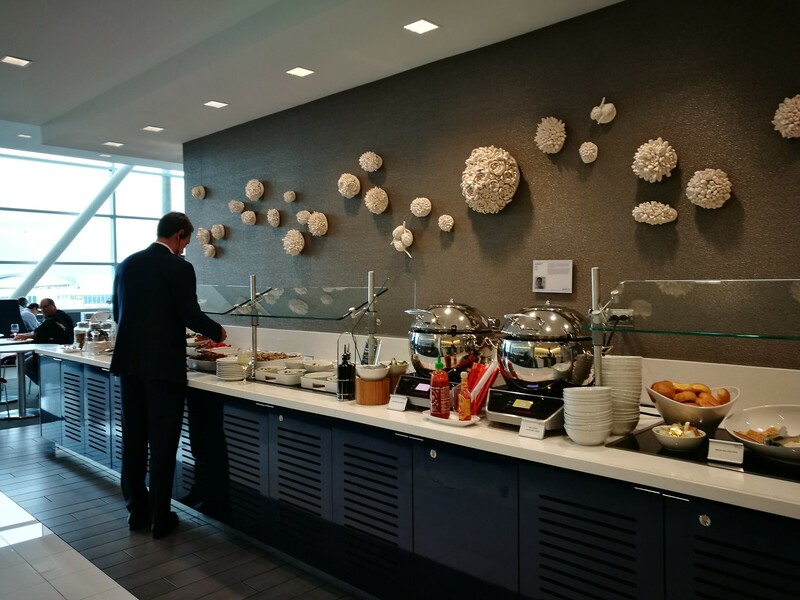 For breakfast, the Sky Club has a decent selection that was slightly better than some airport lounges but lacks the quality I saw at the new Seattle Sky Club. The selection were mainly continental and cold. 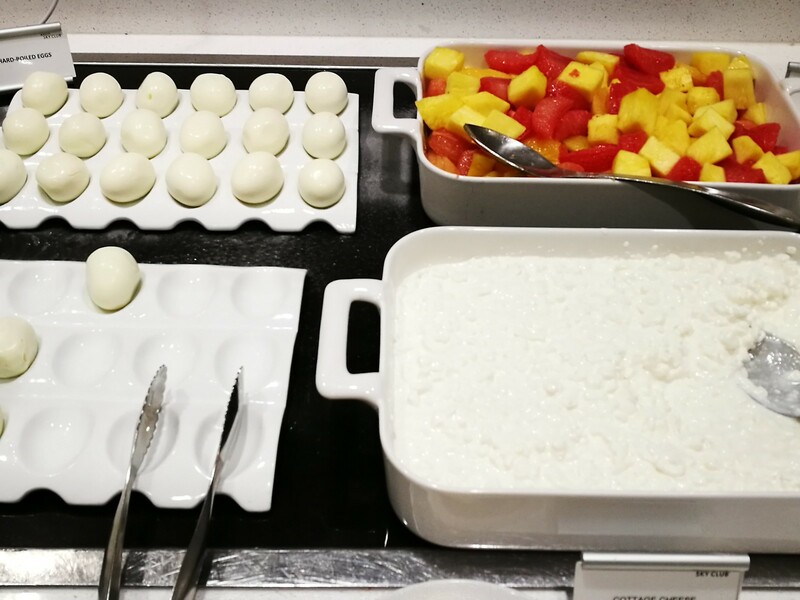 Choices like boiled eggs, yogurt, canned or cut fruits, cottage cheese and the common toast and sweet pastries makes up the majority. 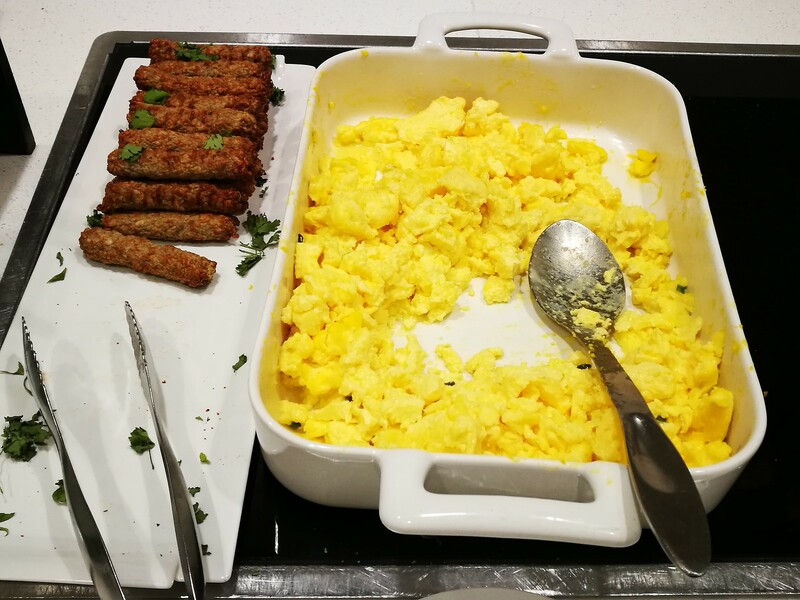 The hot choices were scrambled eggs and sausages, both of which I sampled but did not even manage to eat more than a few bites. 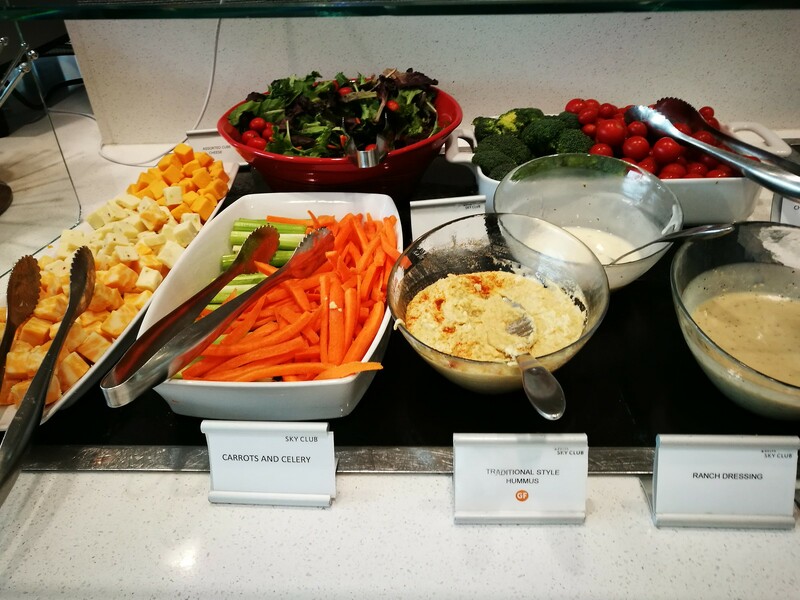 On my first visit here, the lounge was serving lunch and this was the spread, which I felt was much better than breakfast. 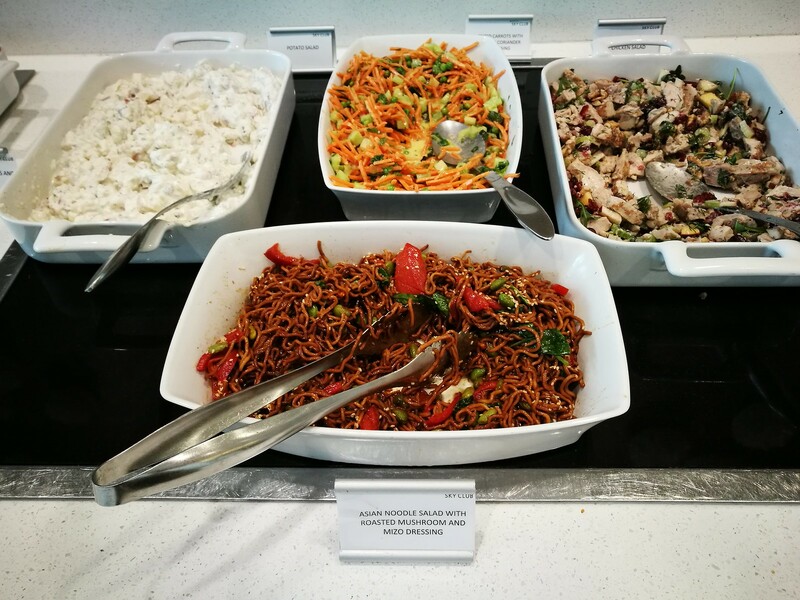 There was a good selection ranging from salads and fresh cut vegetables with dips to cooked Asian inspired dishes likes fried rice and pho. 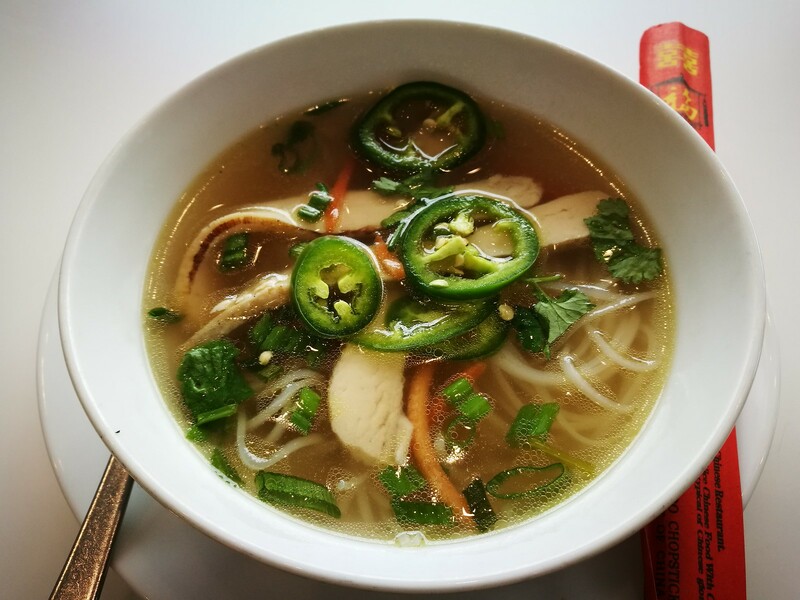 Although the pho uses the cheaper chicken breast slices which does make it not at all authentic. Aside from the main courses, there are also some brownies for desserts and assorted cookies in jars. There was also fresh bananas and apples to pick from for a healthier snack. In fact I filled myself with one piece of banana for breakfast as well since many of the choices in the morning did not entice me. 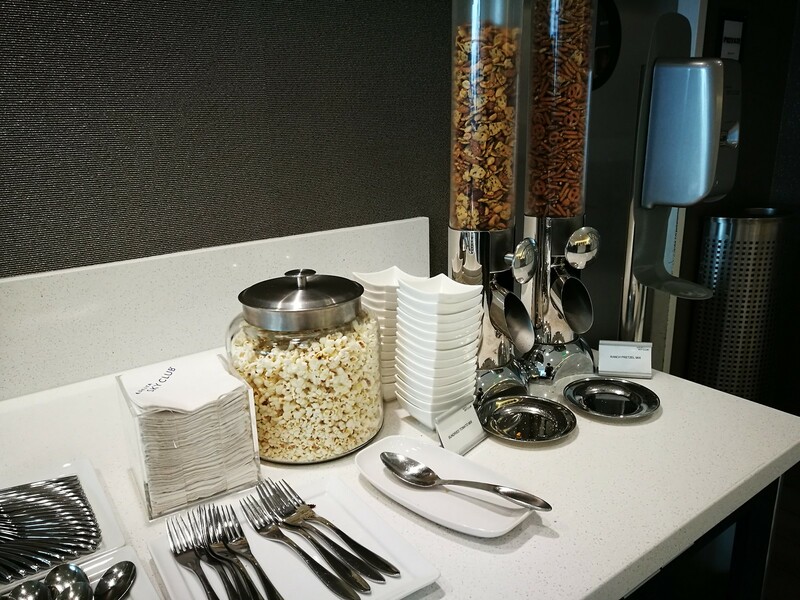 Snacks served in the day includes mixed nuts and popcorn which was another enjoyable food inside this lounge. 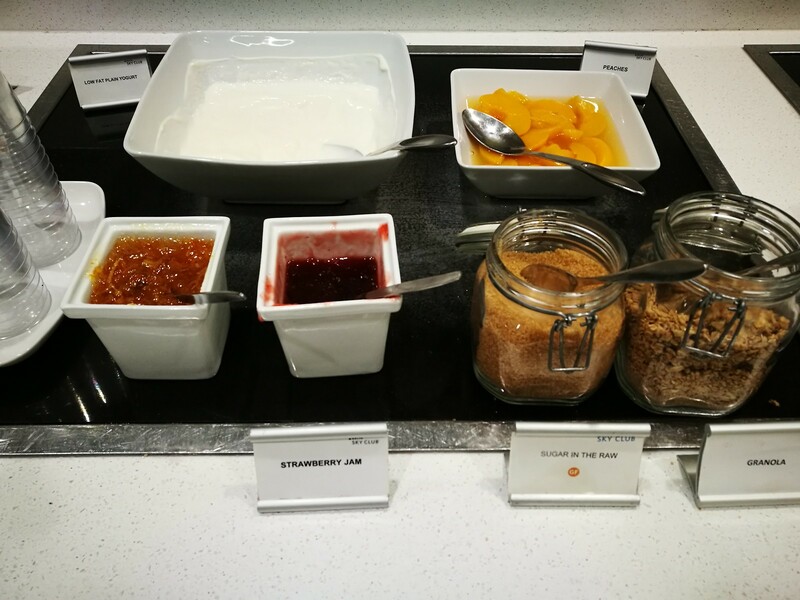 Overall the food selection varies during the time of your visit and I found it adequate but better than the average airport lounge in the United States. Guests could also help themselves to the espresso machine with Starbucks coffee and premium tea packets inside the lounge which does elevate the experience as well. For alcoholic drinks, eligible guests could get drink coupons otherwise they are chargeable. 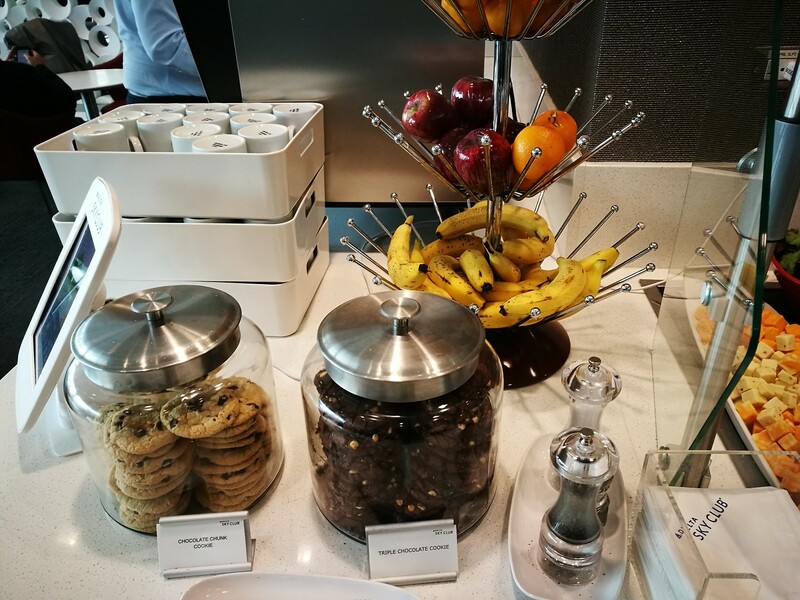 Juices, water and a variety of soft drinks are still complimentary and obtainable from the bar area which is usually the noisiest part of the lounge. While dining there are plenty of tables and chairs beside the wall mural, while the bench seats below the mural was occupied mainly by guests on their laptops due the power outlets. 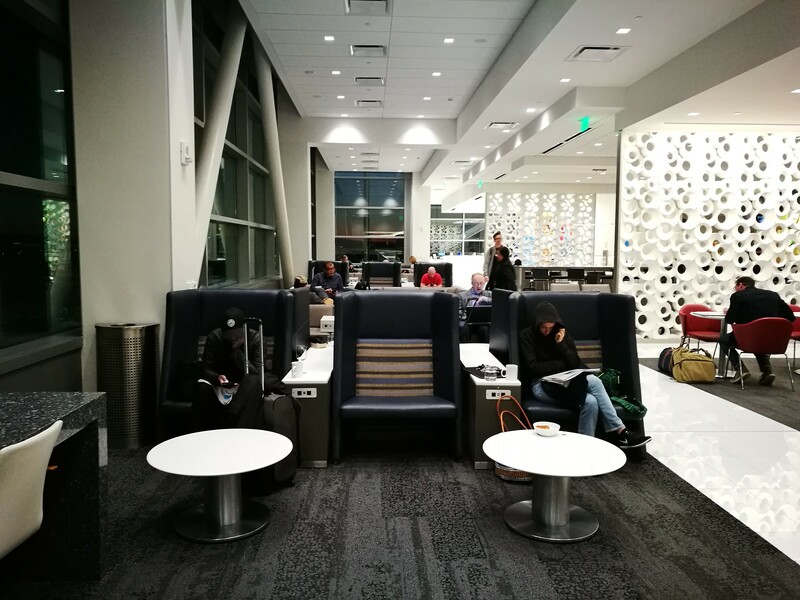 Speaking of power outlets, the lounge has plenty of them since most of the lounge seats have a power and USB output in between them making this a great space to work and recharge your devices in between flights. 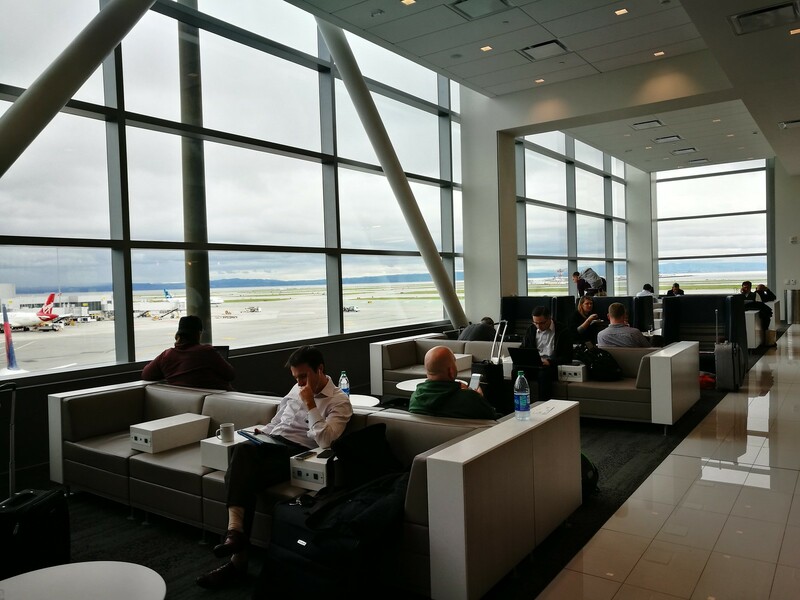 It is also nice for many of the seating space to be situated beside the tarmac creating an area filled with natural light. Not to mention, occupants of these seats get a nice view for plane spotting. For those seeking a more private work space, there is a bar table section at the back before the shower areas and close by the buffet section. This space allows guests to dine and work at the same time and there are even compartmentalized sections for them to work individually. 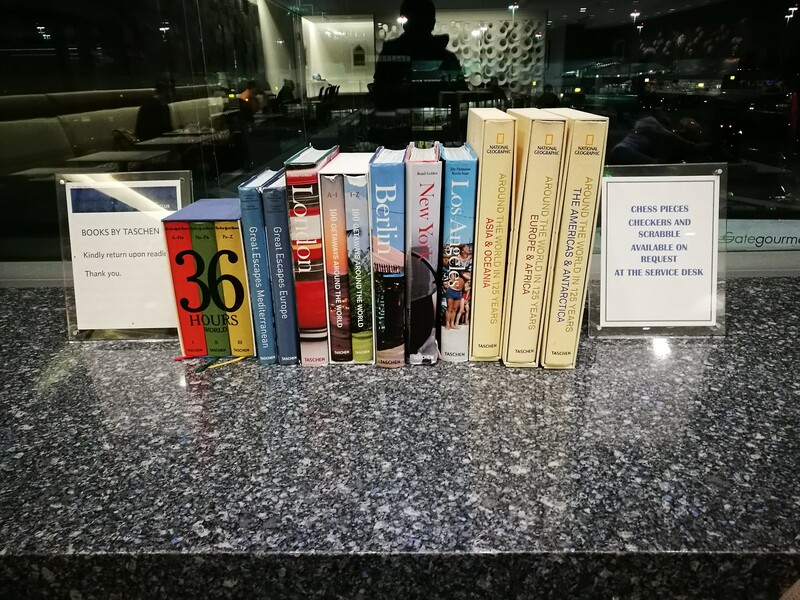 Another amenity inside Delta Sky Club is the availability of reading materials. 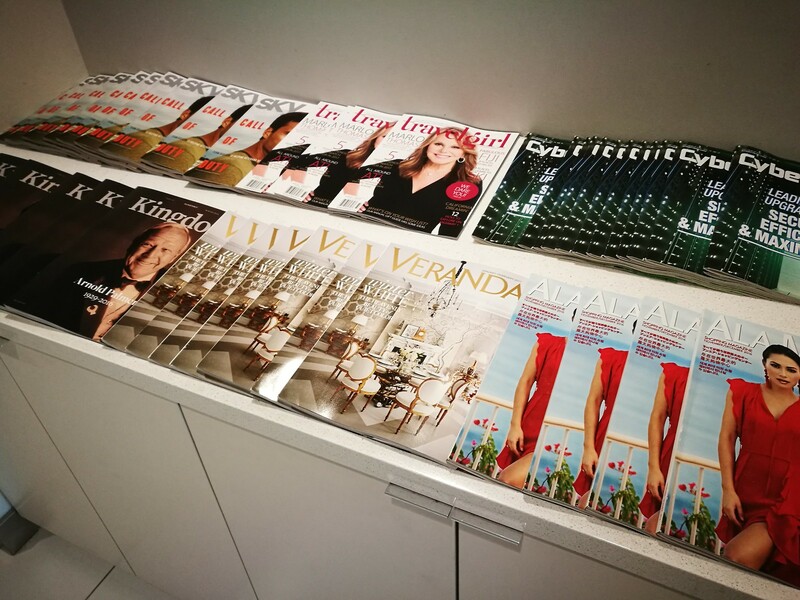 There was a cabinet filled with various magazines and newspapers near the work station cubicles and a small selection of travel and photo books by the windows. 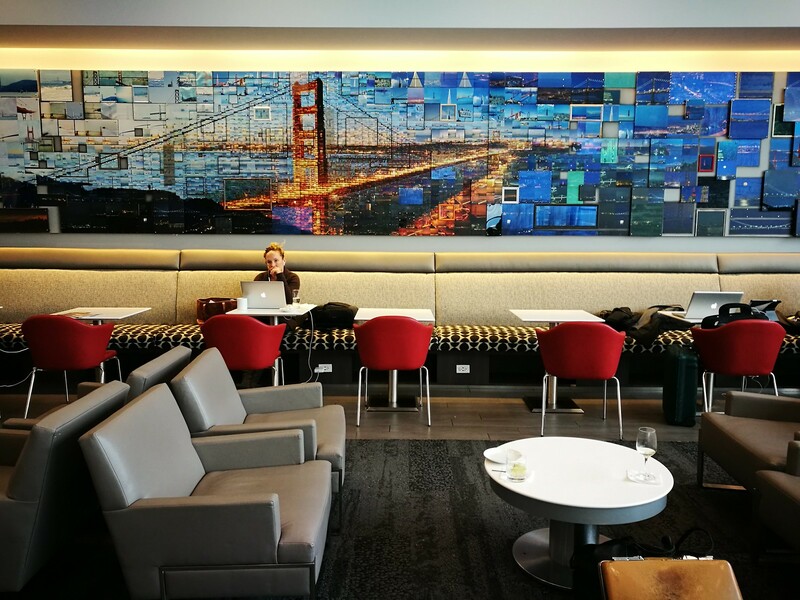 All things considered, this was another good lounge that certainly elevates the Sky Club experience and flying with Delta on a premium ticket. 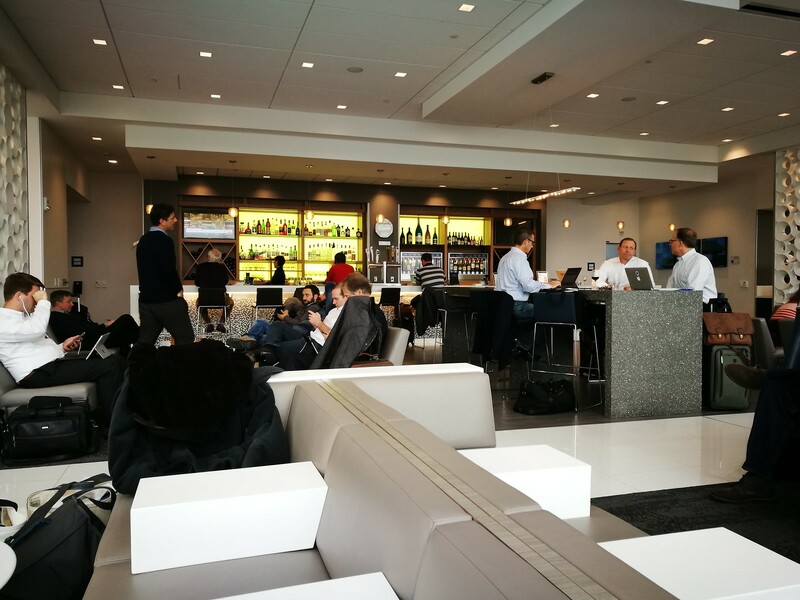 I do have to mention though not even Sky Team Elite Plus or high tier members get access to this lounge, and I did only because I hold a same-day international ticket. 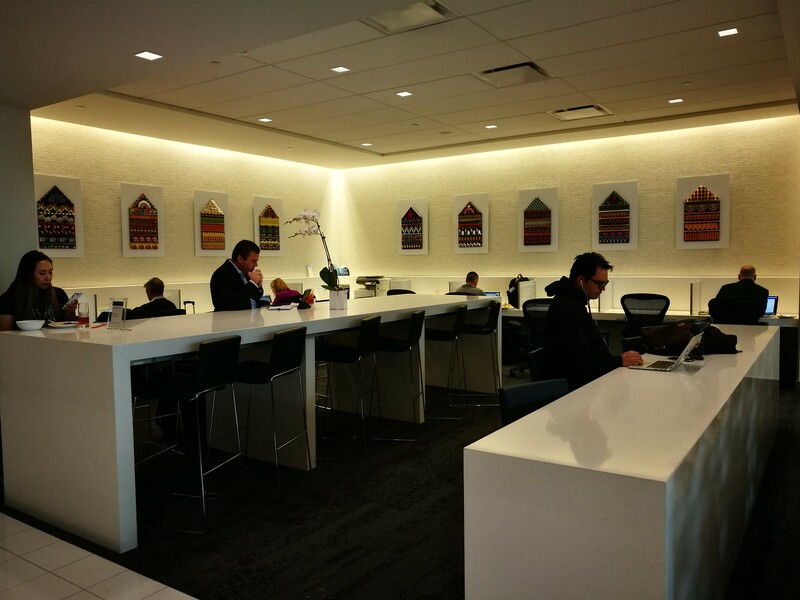 Delta might have made the access more stringent but the lounge did have a certain level of quality. Even if it is not on par with the lounges in Asia, it is probably the better ones amongst US-based carriers. 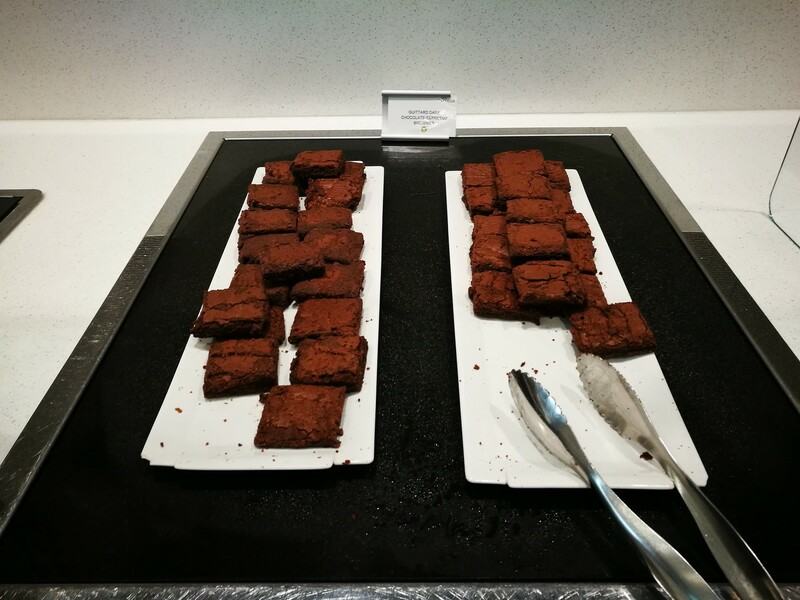 The great lounge product sure makes it easier to fly them even with the stopovers involved!